Why are wood fires so cozy and comforting? There is nothing like curling up in front of a blazing hearth to bring the day to a relaxing conclusion. Science has proven in several studies that sitting by a wood fire will actually lower your blood pressure significantly. One scientist suggests this phenomenon is a throwback to our early ancestors, memories encoded in our DNA from millennia of wood burning fire being one of the most important insurances of safety and security. Sitting by a fire meant cooked meat, warmth in the cold weather, a deterrent to predatory and scavenging animals, as a repellant to insects, light in the darkness, and the comradery that ensues around a cozy fire… All these things added up to relaxation for our distant relatives and apparently the dazzling blaze and crackling sound might be triggering very old memories in us. The multi-sensory aspect of wood fires reinforces those sensory memories in several parts of our brain, and we are lulled into a relaxing, blood pressure reduced state. Don’t stop taking your meds though! It’s an interesting theory for sure and makes a lot of sense. 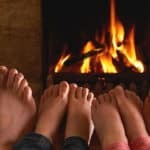 No wonder the sound of a crackling fire, the distinctive smell, and bright red and gold flickering flames, can help wind down after a stressful day, or be the perfect ending to a day of fun in the snow with the family, while heating your home at the same time.